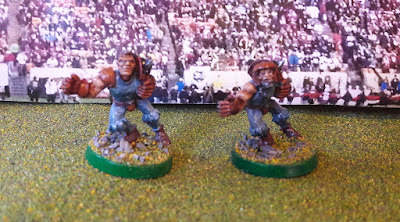 My fourth complete Blood bowl team - the human team of Garroting'em Forest. I make no apologies for the awful name - I like puns. I'm not a fan of Nottingham Forest, nor is this in any way a nod to GW who are based in Nottingham. I just aim for puns that will make a grown man cry. Anyway, this is actually a repaint of a team I built about two-and-a-half decades ago. They were originally mainly white with blue and orange trim. They were very "washed out" though so this time up I decided to concentrate on just the blue and orange.